Paradoxically, the work's deliberate archaisms now seem to strike a notably contemporary resonance in the context of the current popularity of the music of religous composers such as Pärt and Górecki. John Pickard writes about Edmund Rubbra's Meditations on a Byzantine Hymn in a perceptive sleeve note for the CD seen above. Rubbra composed his Meditations for solo viola in 1962 and later made the two viola arrangement recorded by members of the Dante Quartet. Rubbra's string quartets, which are the main works on the disc, are well worth investigating, particularly the taut Fourth from 1977, which is dedicated to Robert Simpson. Wonderfully committed playing from the Dante Quartet and glorious Snape Maltings sound engineered by Tony Faulkner in 2001 for Dutton. I paid £10 delivered from an online seller. Rubbra dedicated his Sinfonia Concertante for Piano and Orchestra (1934) to his teacher Gustav Holst. The photo below shows Rubbra (left) with Holst and students. 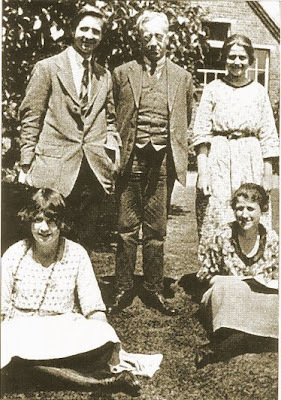 The photo was taken at the then University College, Reading where Holst was professor of music from 1919. Rubbra studied at Reading on a scholarship from 1920. (Coincidentally I studied at what became Reading University from the annus horribilis 1968 to 1971). Part of Holst's familiarisation process with a new pupil was to go on long walks together and discuss the world, so that in his student years Rubbra was introduced by his teacher not only to Joseph Conrad but also to political thinking and socialist ideas, in books such as Benjamin Kidd's Social Evolution. A neat coda to this story is supplied by the news this week that archive footage from the 1970s has been discovered showing Edmund Rubbra, Imogen Holst and Herbert Howells talking about Gustav Holst. There is a clip on the BBC website that includes fascinating and very rare footage of Rubbra. More variations on an Orthodox theme here. Damn! Dutton has some really good material. I really like their re-issues. It is good, and rare, to see original and distinctive sleeve art on a CD these days. 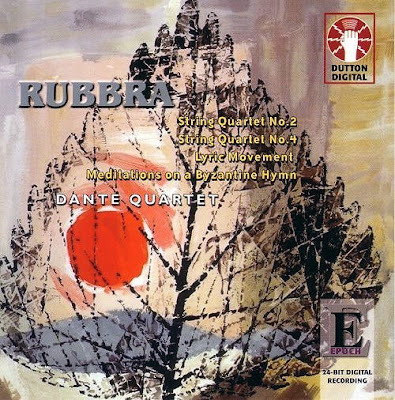 The cover graphic on this, and the other Dutton recordings of Rubbra's chamber music, use motifs taken from the poster collection of the London Transport Museum.